At Clementine, we believe it is of utmost importance to demonstrate the effectiveness of our programs through data collection and research. Beyond asking clients to report on how helpful and satisfied they were with their treatment experience, we have conducted a study examining measurable and meaningful changes in weight and clinical symptoms. Preliminary results of our study demonstrate statistically significant weight gain in our patients with Anorexia Nervosa (AN) who participated in our residential level of care (LOC), with over 90% of them achieving weight restoration by discharge, defined by a body mass index (BMI) greater than 18.0. We also believe it is important to demonstrate treatment outcomes beyond weight restoration. Effective treatments must also address the core psychological and behavioral symptoms of the eating disorder, which have an extensive impact on the lives of our patients and their loved ones. We conducted another preliminary study that examined symptom change in a subset of patients who participated in our residential and/or partial hospitalization program LOC. Importantly, the sample included patients with a diagnosis of Anorexia Nervosa and Bulimia Nervosa. Our data analysis also revealed clinically and statistically significant symptom reduction (depression and eating disorder symptoms) and improved quality of life from admission to discharge. In addition to sharing these preliminary findings, we will also discuss the state-of-the-art research program we are in the process of developing. 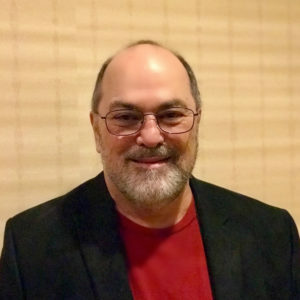 Dr. Tim Brewerton is a Senior Advisor for Clementine Programs and a Co-Principal Investigator as approved by the Institutional Review Board, which ensures our research is conducted in accordance with all federal, institutional and ethical guidelines. Dr. Brewerton consults with our clinical leadership team on our research and outcome assessment protocols. A specialist and recognized expert on trauma and substance abuse, Dr Brewerton also provides supervision to clinicians trained in Cognitive Processing Therapy and consults with us on developing and enriching our treatment programming for our clients with complex co-occurring presentations. 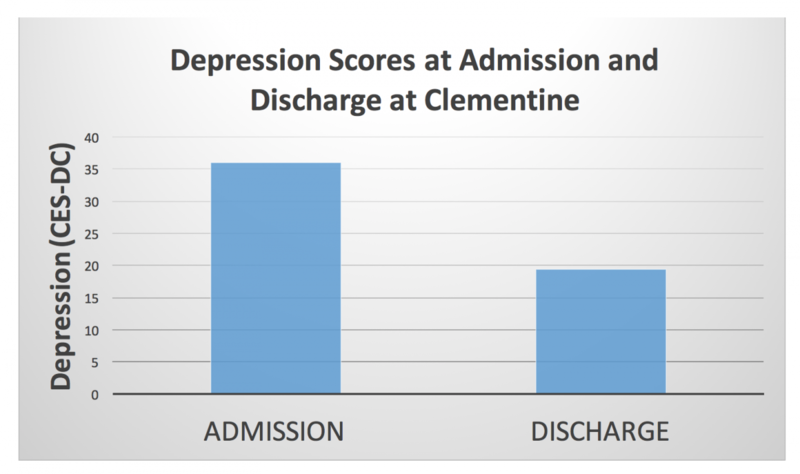 We examined weight change data for all adolescent patients diagnosed with AN, according to DSM-5 criteria, who admitted to and discharged from residential treatment at Clementine Miami centers in 2016. Notably, one patient was excluded from the analysis as she participated in less than one week of programming. This study included data for 24 residential stays. The average length of stay in residential was 67.2 days. 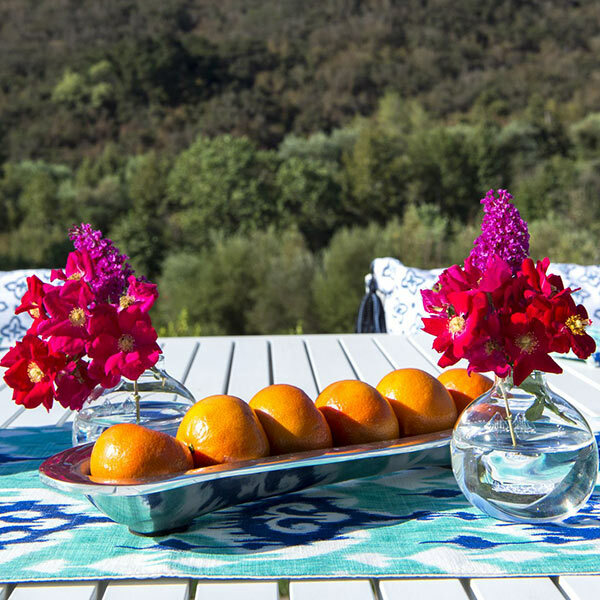 Overall, results demonstrate weight gain in our patients with AN who participate in our residential LOC, with a high percentage discharging weight restored. 16.7% of adolescents in this study admitted with either a diagnosis of AN, Severe (BMI 15 – 15.99) or AN, Extreme (BMI < 15). Severity ratings are based on DSM-5 criteria. The average BMI of adolescent patients with AN admitting to residential care at Clementine was 17.6. The average BMI at discharge was 20.4. 92% of our adolescent patients with AN restored their weight to a BMI ≥ 18 by the time of discharge from residential LOC. As expected, results demonstrate a statistically significant increase in BMI for our adolescents from admission to discharge, t(24) = -7.687, p = 0.000. On average, patients experienced a BMI increase of 2.87 over the course of their residential admission. Note: this specific statistical analysis was conducted with the complete N of 25. We collected symptom change data for a subset of our patients who admitted to and discharged from our Clementine programs in 2016. Specifically, we assessed symptoms of depression (Center for Epidemiological Studies Depression Scale for Children), eating disorder symptoms (Eating Disorder Examination – Questionnaire) and quality of life (Eating Disorder Quality of Life Scale) upon admission and discharge. 39% of all patients treated at Clementine Miami locations in 2016 successfully completed the study (N = 18). We are actively working on improving our percentage completion for future studies by creating new administration protocols that are more specific and user-friendly. Given the small sample size, we present these preliminary findings with caution. Please see the Future Directions section below for more details on our new research program. The majority of the completed survey sample (66.7%) completed both residential and partial hospitalization program (PHP) stays in Clementine. Therefore, the symptom change data presented at this time largely represents the combined experience across the combination of both levels of care. Average length of stay in residential LOC was 59.9 days, average length of stay in PHP LOC was 31.6 days and total average length of stay in Clementine (residential and/or PHP programs) was 77.83 days. The sample included the following eating disorder diagnoses: 61% AN-Restricting type, 20% AN- Binge/Purge type and 20% Bulimia Nervosa (BN). Importantly, this group of patients also presented with multiple co-morbidities: 94% were diagnosed with an anxiety disorder, 83% were diagnosed with a mood disorder, 11% were diagnosed with a substance use disorder and 11% were diagnosed with post-traumatic stress disorder. 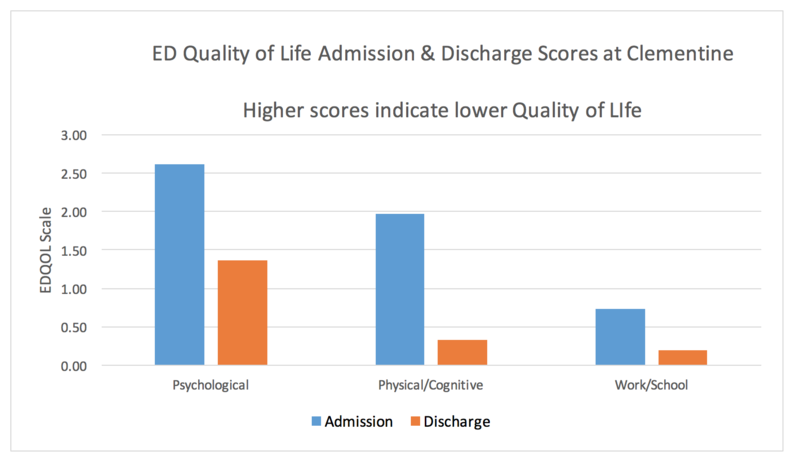 Overall, these preliminary findings show clinically and statistically significant symptom reduction (depression and eating disorder symptoms) and improved quality of life from admission to discharge. Please see the Future Directions section below for more details on our new research program. Upon admission, patients reported an average depression score of 36.06 on the Center for Epidemiological Studies Depression Scale for Children (CES-DC), indicating severe depression. On the CES-DC, a score over 15 can be indicative of significant levels of depression. Upon discharge, patients reported an average depression score of 19.44. Although some symptoms of depression remained, there were substantial improvements (a 16.62 point drop). Further data analysis revealed that this reduction in depressive symptoms was statistically significant, t(17) = 5.551, p = 0.000. Patients experienced clinically significant reductions in eating disorder symptoms over the course of treatment. On average, patients presented at admission with severe eating disorder symptoms (relative to a community sample of young adolescent girls aged 12-14 years*). Upon discharge, average adolescent scores on the Eating Disorder Examination –Questionnaire (EDE-Q) were consistent with the community norms, suggesting clinically significant improvements. 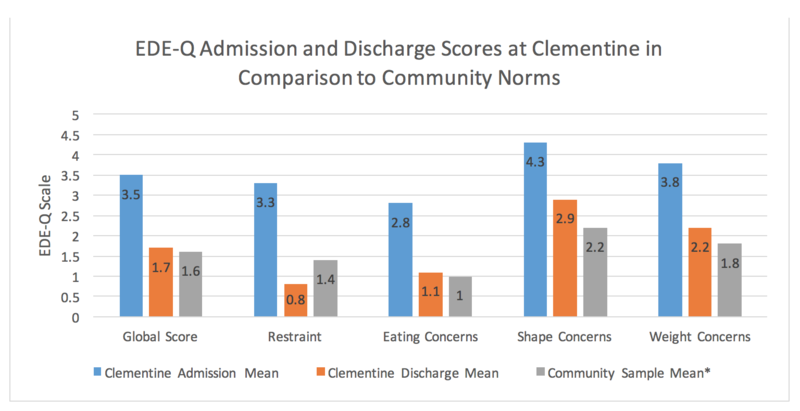 The chart below provides mean admission and discharge scores at Clementine in comparison with a non-clinical, community norms. *Eating disorder examination questionnaire: norms for young adolescent girls. Carter, J.C., Stewart, D. A., & Fairburn, C.G. (2001). Behaviour Research and Therapy, 39, 625-632. ** We recognize the limitation of this norm comparison group as it is restricted by age for girls 12-14. Additional research is needed in the field to better establish norms for older adolescents. Preliminary results also demonstrate statistically significant reductions on the global scale as well as all subscales of the EDE-Q. This subscale captures the following symptoms: restraint over eating; avoidance of eating; food avoidance; wanting an empty stomach; following strict dietary rules. This subscale captures the following symptoms: Preoccupation with food, eating or calories; fear of losing control of eating; eating in secret; guilt about eating. This subscale captures the following symptoms: Desire for a flat stomach; preoccupation with shape or weight; importance of shape; fear of weight gain; shape dissatisfaction; discomfort seeing body; feeling fatness; avoidance of body. This subscale captures the following symptoms: Desire to lose weight; importance of weight; reaction to weight; preoccupation with shape and weight; dissatisfaction with weight. Preliminary results demonstrate statistically significant improvements in psychological, physical/cognitive and work/school quality of life. This domain assesses how the eating disorder is perceived to have impacted thoughts and feelings about oneself. This domain assesses how the eating disorder is perceived to have impacted physical sensations and cognitive capacity. This domain assess how the eating disorder is perceived to have impacted performance at school or work. * It is preferable to measure quality of life once a client has fully discharged from residential and/or PHP care and is engaged in life outside of treatment. Our new research program (see Future Directions) will allow us to obtain this important post-discharge data. We are pleased to share these preliminary findings with you. At Clementine, we believe that demonstrating the effectiveness of our programs is of utmost importance. These findings are an important step towards this goal. That said, we hold ourselves to the highest scientific standards and acknowledge the limitations of these preliminary studies, particularly the small sample size for the symptom data results. Therefore, we are actively in the process of developing a state-of-the-art research program that will track client progress throughout treatment and up to one year follow up post-discharge. The research protocols have been approved by an Institutional Review Board. We have assembled a Monte Nido & Affiliates Research Committee of both in house and outside consultant researchers with extensive experience in the eating disorder field who are actively working to implement our new program. We are incredibly excited about this program which is scheduled to launch in 2017.